The light of love may shine alway." Calendar from the French magazine Le Petit Journal with scenes including (clockwise from top left) the capture of a German battle flag by Zouaves and Chasseurs à pied, a French artillery crew manning a 75mm. field gun, a dragoon moving into position, a heavier gun firing, entrenched troops, and marines advancing. 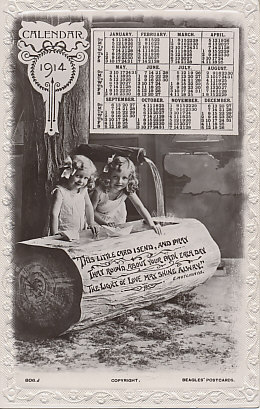 The calendar includes Roman Catholic holy days, saints days, Independence Day, and the time of sunrise and sunset. Illustration by L. Bomblec (?). Children dressed as Allied soldiers run to bring the New Year, 1916. France carries the 1, the United Kingdom (in a kilt) and Belgium - his national roundel on his hat - the 9, Serbia and Russia the 1 of the decade, and Italy the 6. Japan, bearing a flag, hurries to catch up. 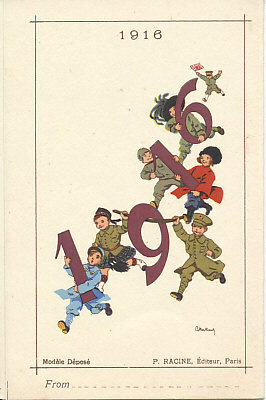 A folding calendar card for 1916 by G. Bertrand. 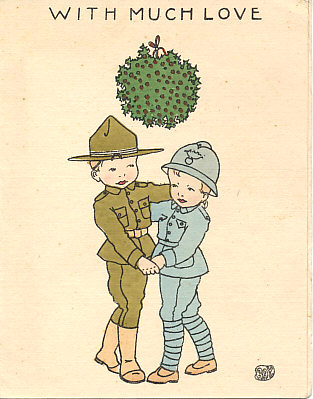 1918 YMCA folding calendar card of two child French and American soldiers dancing beneath a ball of mistletoe and the words "With much Love", by Ray or R.A.Y. During the four and half years of the Great War from the summer of 1914 to November 11, 1918, over eight million combatants and six million civilians died. 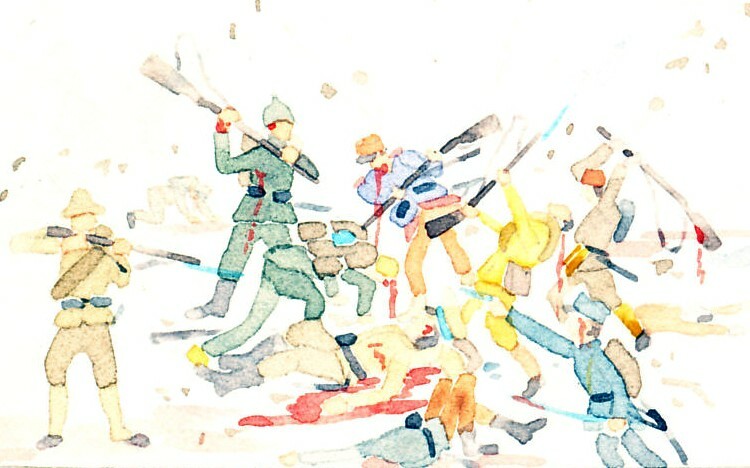 In battle, they were killed by new and increasingly powerful weapons, 70% by artillery fire, and in higher percentages than in Europe's wars of the previous century. Civilians died from starvation, from being shelled and bombed, and from genocidal operations against ethnic minorities. In the war and its aftermath, the empires of Germany, Austria-Hungary, Russia, and Turkey were destroyed, and new nations were born and reborn. New technologies were invented and young ones advanced rapidly - the airplane, poison gas, the machine gun, the tank, flame-throwers, submarines. Industrial production of the technologies, of shells, of bullets, of barbed wire, grew to unprecedented levels. Societies changed. Women entered the wage labor market to free men up for combat and to meet the production demands of the war. Passports, identity cards, and increased border controls became increasingly common. When the war itself ended, related wars continued: in Russia, Civil War between the new Bolshevik government and its enemies, both foreign and domestic; in Turkey, war by Greece to seize islands in the Aegean Sea and parts of the mainland of Turkey itself; in Ireland, war for independence from Great Britain. On Sunday, June 28, 1914, in the city of Sarajevo, in Bosnia-Herzegovina, a province of Austria-Hungary, a team of seven conspirators with grenades, pistols and cyanide capsules/tablets, joined the crowds that had turned out to see Archduke Franz Ferdinand, heir to the throne of Austria-Hungary, and his wife Sophie von Hohenberg. A failed assassination attempt - a grenade that slightly wounded spectators and two in the royal couple's entourage - altered some plans and led to other events. A planned visit to City Hall went ahead, but a decision to visit the victims in hospital necessitating a changed route, a failure to inform the drivers of the change, the lead driver's attempt to back to correct the mistake - put the Archduke's stopped car in front of the most determined of the assassins, the Bosnian Serb Gavrilo Princip. He stepped forward, averted his eyes, and fired twice, shooting the Archduke through the throat and his wife through the groin. The couple was dead within an hour. The gun, the bombs, the cyanide Princip took, and some of the conspirators would be traced to Serbia. The Archduke was not popular in Austria-Hungary, and the reaction to his death was muted. But Austria-Hungary was a multi-ethnic, polyglot nation with populations that wanted to leave the empire. Princip had acted to advance his vision of a union of South Slavs that included Serbia and Bosnia-Herzegovina. In Vienna, the capital, government officials feared the rise of Serbia, which had been victorious and doubled its size in the Balkan Wars of 1912 and 1913. Initial concerns in other European capitals of an Austro-Hungarian response to the assassination lessened as July passed. In Petersburg, the Russian capital, government officials felt they must support Serbia if Austria-Hungary acted. The French and Russian governments communicated their support of their alliance and mutual commitment to aid the other in the event of war. The government of Great Britain, the third member of the Triple Entente with Russia and France, heard little that alarmed it. In Berlin, capital of the German Empire, which was allied with Austria-Hungary and Italy in the Triple Alliance, there was support for a quick and limited military action by Austria-Hungary. Defeated by Japan in the Russo-Japanese War of 1905, and humiliated in 1908 when it failed its Balkan ally Serbia, and did not prevent Austria-Hungary's incorporation of Slavic Bosnia-Herzegovina, many government officials in Russia felt the country must act in the next crisis when it inevitably arose. Many in the French government wanted to restore the provinces of Alsace and Lorraine it had lost to Germany in the Franco-Prussian war of 1870-71, but feared a Germany that had a population half again as large as that of France, and worked to strengthen its ties with Russia, in part by financing its ally's rapid recovery from the 1905 war. Having seen the creation and rise of the Balkan states of Serbia, Bulgaria, Romania, Montenegro, Albania, and Greece, that had all wrested land and nationhood from the Ottoman Empire, and had come close to eliminating Turkey in Europe, Austria-Hungary feared losing its peoples and territories to these nations and to nations that did not yet exist. Great Britain, with the most powerful fleet in the world, and rule over one quarter of the world's population, but with a small army that was not structured for a European land war, was troubled by Germany's expansion and strengthening of its fleet. Many in the German military thought that war with Russia was inevitable, and that, with the recovery of Russia from the war and revolution of 1915, it should come sooner rather than when Russia had become even stronger. The military also feared a two-front war, facing France to the west, and Russia to the east. The military plan to address this, the Schlieffen Plan, aimed for a rapid defeat of France so that troops could be transported by rail across Germany to face the slowly-mobilizing Russians. When Austria-Hungary's response to evidence that Serbia had played a role in the assassination came, there was little time for governments to react. Austria-Hungary submitted demands of Serbia that included unconditional acceptance within 24 hours. As European governments learned of the response, and hurried to react, Serbia accepted all by one of Austria-Hungary's demands, that which most impinged upon its sovereignty. The ambassador receiving the response left immediately for Vienna. On July 28, Austria-Hungary declared war on Serbia, and on the next day bombarded Belgrade, its capital. Russia mobilized its army in support of Serbia, but with a mobilization plan that activated troops facing not only Austria-Hungary but also Germany. On August 1, Germany declared war on Russia and invaded Luxemburg to begin its assault on France. France ordered general mobilization effective August 2, and began executing its plan to attack Germany along their border, through Alsace and Lorraine. On August 3, Germany declared war on France, and requested passage of its troops through Belgium to attack France along its northern border. Belgium, defending the neutrality that France, Germany, and Great Britain had pledged to support, refused. On August 4, Germany invaded Belgium. In Great Britain, where there was significant opposition to the war, the invasion of Belgium shifted the opinion of the public and the government. Britain declared war on Germany. Across Europe, millions of men were in motion, on trains, horseback, and on foot. France and Britain were bringing troops and laborers from its colonies and the British Commonwealth, France from Algeria, Senegal, and Dahomey, Britain from Egypt and India. Generals had not assembled armies this large before, and had not put them into motion, nor led them into battle. Most generals, most soldiers, most civilians thought the war would end in months, that their their army would be in Berlin, in Paris, in Petersburg, by Christmas, before 1915. Only a few saw this war would be different, and would not end for years.